What is the Beat Retreat? 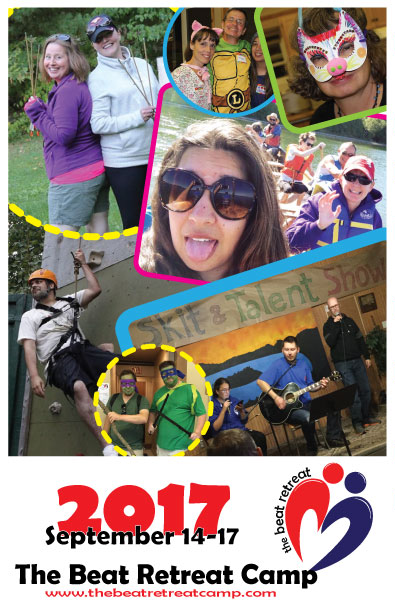 The Beat Retreat is a fun-filled, four-day weekend for adults with congenital heart disease. You’ll have an opportunity to participate in a mix of traditional camp activities – all geared to your physical ability and comfort level. Equally important, you’ll have an opportunity to make new friends and learn from the experiences of other CHD patients. You’ll also have an opportunity to chat with healthcare professionals in a relaxed and informal setting. In short, it’s a weekend of fun, friends, firsts, and great good. When is the 2017 retreat? This year’s retreat will be help on September 14 – 17, 2017. If you can’t make it for the entire weekend, that’s okay – come for the part that you can. The retreat is held at Camp Quin-Mo-Lac – a beautiful 240-acre camp located on the shores of Moira Lake. That’s about 30 minutes north of Belleville, Ontario (about 2.5 hours from Toronto and Ottawa). You can learn more about Camp Quin-Mo-Lac at www.campqml.org. While at camp, you can look forward to a range of activities, such as campfires, canoeing, crafts, archery, initiatives, yoga, Kangaroo Kourt, skit night, and a polar bear dip. You’ll also have the opportunity to attend a range of education sessions and ask questions to cardiac healthcare professionals. All activities are geared to CHD patients. You decide which activities are right for you – based on your interests, ability and comfort level. Where do we stay during the retreat? We offer a true “camp experience”. That means you’ll be stay in a comfortable, but rustic lodge. You’ll enjoy the “luxury” of a heated sleeping cabin, but you’ll also be sharing a room with others and sleeping on a bunk. Linen and pillows are no provided, so you’ll need to bring a sleeping bag and a pillow. We want the retreat to be a financially accessible, so we keep your costs as low as possible. All you have to pay is $150. That covers your food, accommodations and all activities. If you’re unable to pay the full $150 registration fee due to financial hardship, let us know we have payments options. Of course, if you can afford more than the $150 registration fee, we encourage you to make a donation to The Beat Retreat to help us offset costs. Is there a minimum age for attending? Yes. You must be at least 18 years of age by the first day of the retreat (September 14, 2017). Call or text: Toby Cox at 647-549-1198. Don’t forget to include your name in the text so we know who to contact.